Especially in today’s digital age, we want to stay true to high-quality printed brochures. We are convinced that they offer a more relaxed and pleasant reading experience than computers, with which we spend too much time, anyway. Above all, we believe that fine print material represents us best. It embodies many of the things that have high value in our craftsmanship: The tactile interplay with the material, the presentation through color and light and the pursuit of a perfectly crafted result. We also see it as a commitment to analogy, to reality, to perceptibility. As with the wood we use for our carvings, we take our responsibility to reducing the burden on the environment very seriously. Naturally, we print on FSC certified natural paper with a CO2 neutral process in Upper Bavaria. Depending on whether your interest is more for our family business and unique works or rather for our ALBL nativity scenes, we offer two different brochures. Of course we’ll be happy to send one of each to you, completely free of charge. As a thank-you for your interest in our good craftsmanship. 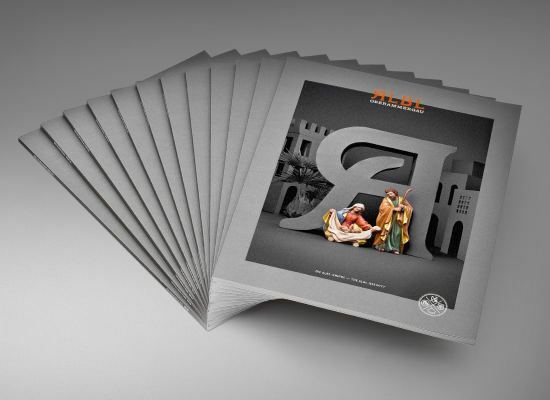 Our studio brochure is divided into two subject areas: In the one, we cover the history of our family with plenty of pictures and information, present our studio, Oberammergau and our way of working in detail and also take a close look at our guiding principles. 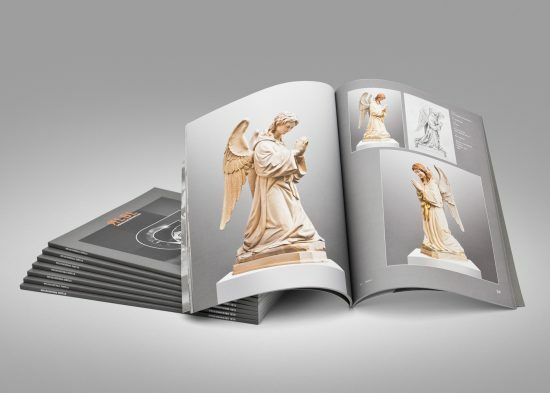 In the other, a large part of the brochure is devoted to our unique works. We describe our customer service and sketching processes followed by a small but broad range of our individual commissions over 40 pages. The portfolio we present concentrates mainly on our unique works for churches and sacred buildings and provides church committees, architects and liturgical consultants a good overview of our craftsmanship. Please note that brochure is in English. Our second brochure is devoted exclusively to our jewel – the ALBL nativity. For over 20 years, families from around the world have enjoyed our unique nativity set – just one of many reasons for having a printed brochure to present the collection in detail. Each figurine is pictured largely in two versions: natural and colored. The whole thing is rounded off with a small excerpt of our family history, its century-old traditions and background stories about our Nativity set. This brochure is produced in two languages – English and German. It’s available free of charge and with every order, we naturally include a price list. We’ll be happy to send you a copy at no charge. Please tick the box for the studio presentation or the nativity brochure, according to your area of interest. You can of course select both brochures. If you wish, we can send you multiple copies, e.g. of our studio presentation. Simply send a short email to johannes@albl-oberammergau.com. We’ll get in touch with you as quickly as possible.